The Star of David Inlay Walnut Cremation Urn depicts a Star of David made of inlaid wood on a background of beautiful walnut. The Star of David, sometimes referred to as the Shield of David, is broadly used as a Jewish and Israeli symbol today. It has had many different symbolisms and meanings over the years. The urn is easily accessed through a bottom plate which attaches with screws. Engraving of name, birth and passing dates, and short sentiment of about 35 letters per line is available for an additional fee. Check spelling, punctuation, capitalization, and dates to make sure they are correct; you will not receive a proof. 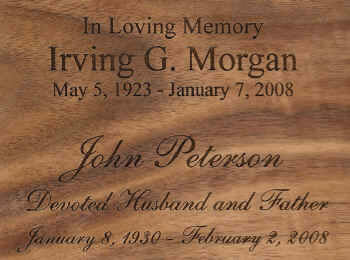 The engraving can be placed on the top of the urn or the back of the urn.